iderdider....: adventures of an impish elf. 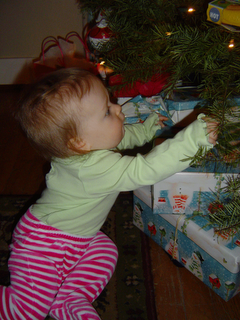 Today, the tree provided crawling incentive. The girl LOVES the sparkly lights and mostly expresses a heartfelt desire to eat the delicious pine needles. Claire has yet to crawl forward, but frequently crawls in reverse and then gets frustrated when she's not where she thinks she should be. Her crawling generally reverts to various yoga poses. Downward facing dog is a favorite. Today, I was also reminded that growing teeth is a wet, wet process. 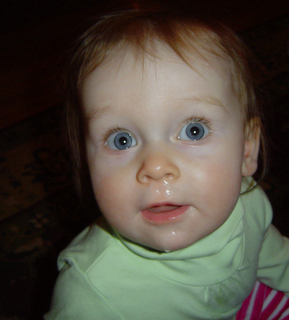 Claire now has 5 teeth and it seems certain that more are on the move, as she has been exhibiting the tell-tale drooly face. A big thank you to Auntie Tiff for the super-cute elfin pants and other lovely (and stylish) (and pink) outfits. We love you.